We've been walking in the gardens at Schönbrunn for at least thirty minutes when I turn to Eldon the Lion Lice Trainer and say, "There's something about this rose garden, those faux Roman ruins, this puddle. I've been here before, haven't I?" "Why don't I remember these things?" "You remembered the puddle," Eldon the Lion Lice Trainer says. "That's something." "You'd think I'd remember that honking palace back there." Actually, Schönbrunn looks a lot like most of the palaces built around the same time: blocky, stately--like a 1940s apartment house with a pretty roof, columns and a grand staircase. It's as if all these monarchs had the drawings of Versailles and said, "Make Us that!" But then they saw what it would cost, coughed and added, "just smaller." By the time King Ludwig II of Bavaria had died under mysterious circumstances--he was using all the kingdom's money to build wacky castles--Schloss Herrenchiemsee wasn't even finished. Very similarly to the Berlin Brandenburg "Willy Brandt" airport or the KDF (Kraft durch Freude) on Rügen, it may never be finished. The Schlosspark at Schönbrunn will never be finished. Something the Austrians share with the Germans? And the trees became walls. 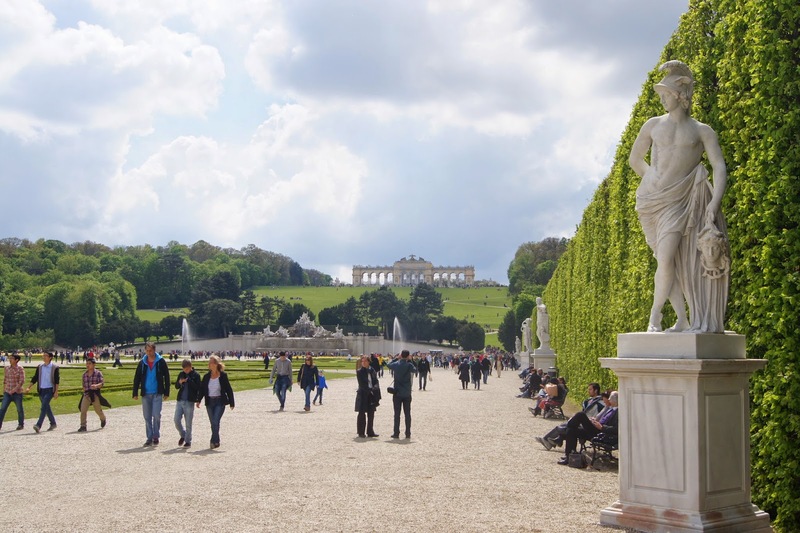 The gardens of Schloss Schönbrunn are a perpetual work in progress. But what a work they are! 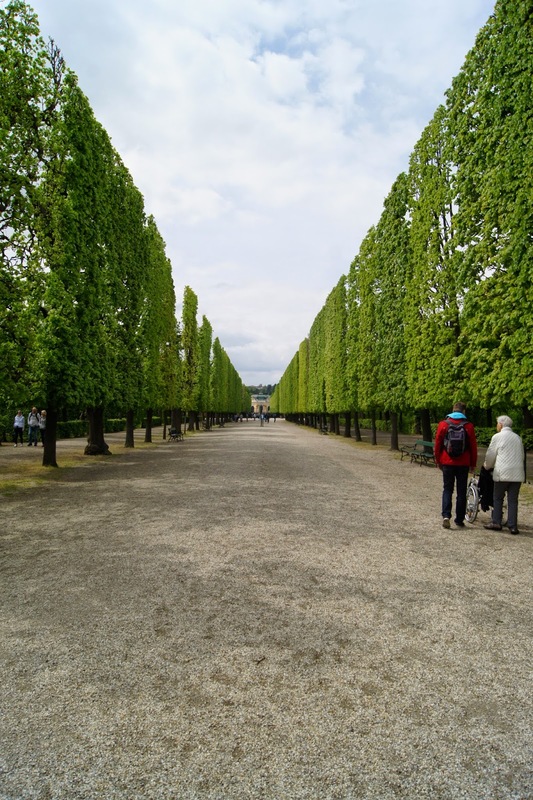 The most impressive parts of the gardens are where the trees are being formed into imposing architectural features: walls, arches, mazes, galleries, etc. The process of training trees to form these elements must take dozens of decades; and of course these are living creatures, which will one day die and have to be replaced--so the process is by nature never finished. I wonder if the original creators of these gardens took this into consideration. If they'd asked me, I'd have told them to build their walls, arches, mazes, galleries and such out of, say, diamonds. Diamonds are forever. "Tourists would steal them," Eldon the Lion Lice Trainer says. "I know I would," I say, looking around sheepishly to see if anyone has heard me. "Phew." The gardens are maintained by the Bundesgärten Wien_Innsbruck of Austria under the direction of Dipl. Ing. (degreed engineer?) Brigitte Mang.And it's a massive undertaking. The Schlosspark also features a zoo, an orangery, a desert house, a palm house and a labyrinth, none of which we went to this go around except for the desert house--because I needed to use the bathroom. Mercifully, the desert house had this little guy on display before the ticket booth. I'd already shelled out 50 cents to use the loo, so I was broke. 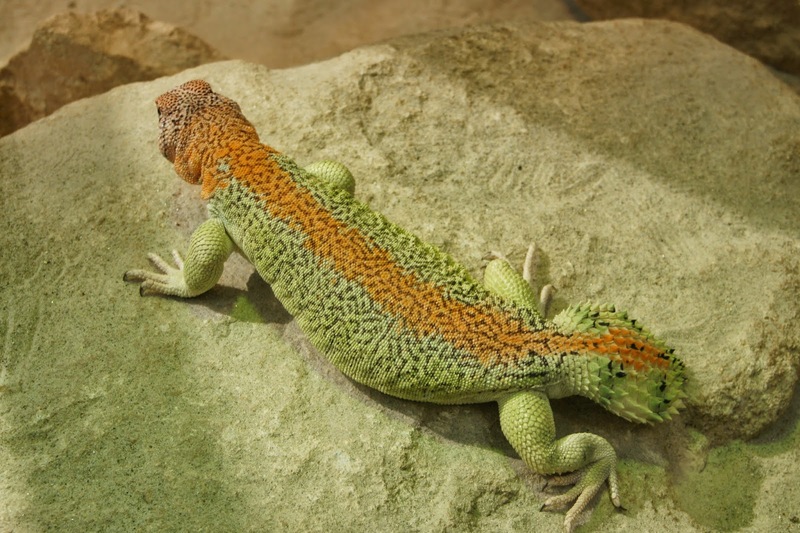 Pretty Lizard-like Animal on Rock with a cute stumpy tail. I hear he digs with it. The crowning glory of Schönbrunn is the Gloriette, which sits atop a 200-foot hill at the opposite end of the grounds from the palace. The zigzag up the hill takes only a few minutes. It'll be good for your legs. The view of the palace and Vienna beyond it is impressive enough but not breathtaking. A bit of trivia: Fischer von Erlach had originally planned to build the palace on th rise where the Gloriette now stands. 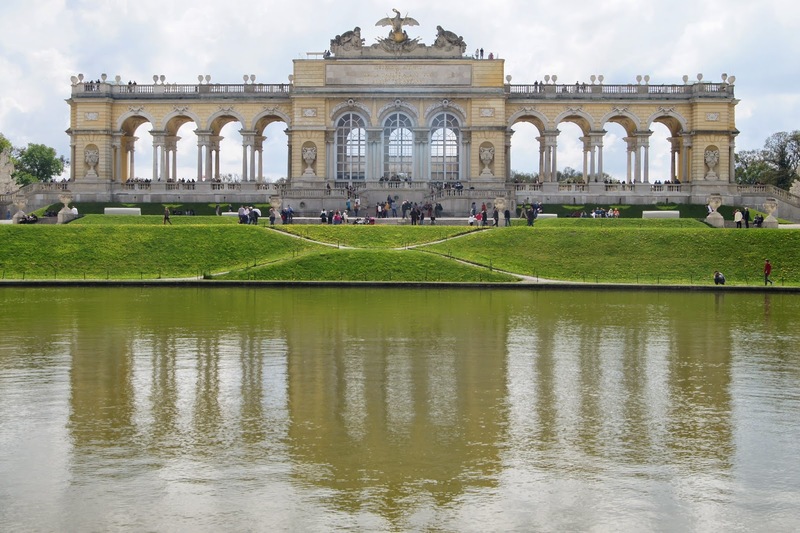 Maria Theresa conceived the Gloriette as a monument to Habsburg power and "the Just War," which would lead to peace. She didn't know much about war apparently. The Gloriette is now a café. At least it's not a Starbucks . . . yet. The Gloriette up close. The café is there in the middle section. I have so many questions about the gardens. How many landscape architects and workers does it take to maintain such a labor-intensive endeavor? 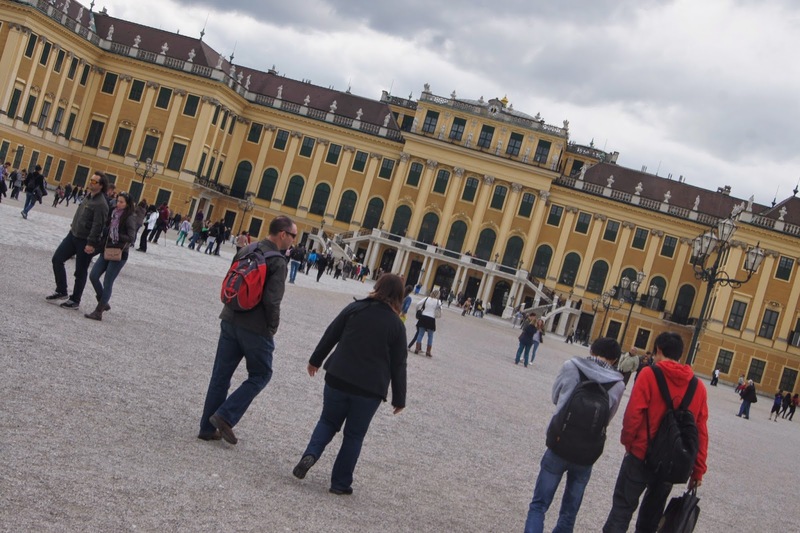 How many of the palace's 2.6 million visitors a year actually spend money at Schloss Schönbrunn beyond the 50 cents for the toilet? Hmmm. OK, I have only those two questions. Have you been to this palace? Did you pay to see the interior, or did you just walk around the gardens and take pictures of ducks in puddles? 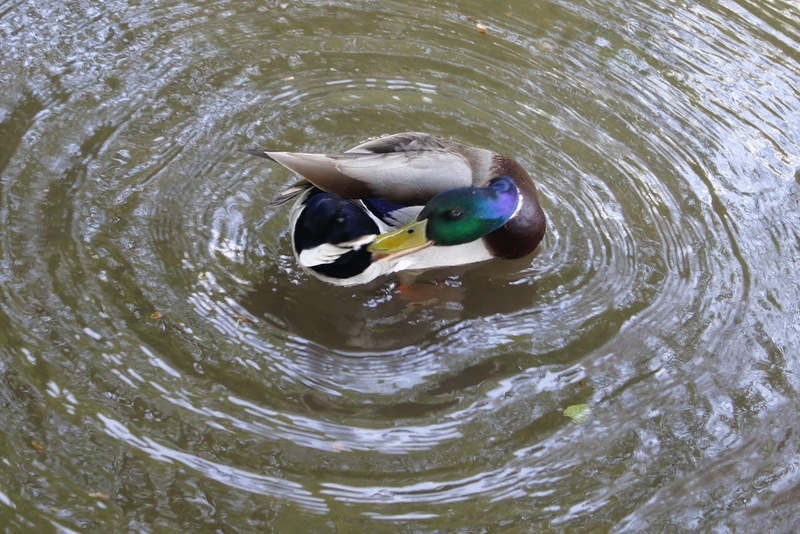 A duck in a puddle--only one of many pictures of ducks in puddles I took at Schönbrunn. 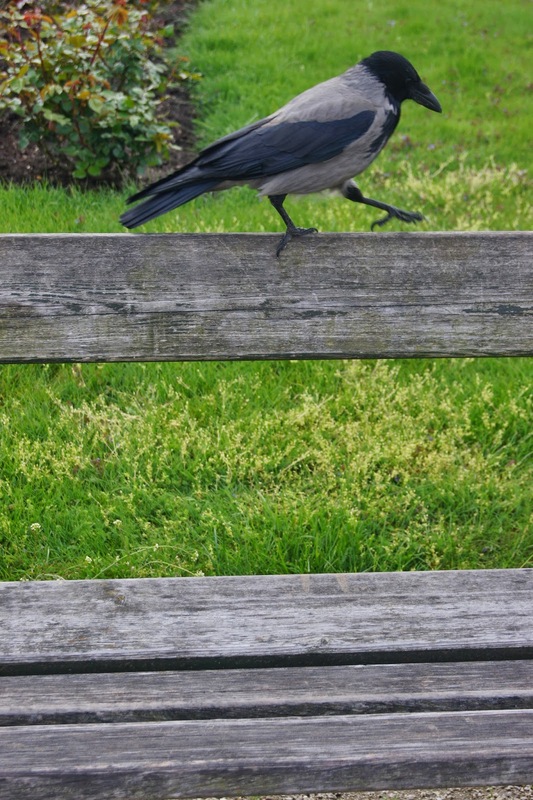 And here: Bird on Bench -- there does seem to be an animal theme to this post. Have you started writing your entry for the Second Annual I Must Be Off! Travel Essay Contest? Check out the guidelines HERE.